Super Savings Item! Save 34% on the Gear S3 Frontier/Classic Sport Loop Band, Fintie 22mm Lightweight Breathable Nylon Replacement Strap Bands with Adjustable Closure for Samsung Gear S3 Smart Watch - Black by Fintie at Kode Fu Guru. MPN: AOWE029A-US. Hurry! Limited time offer. Offer valid only while supplies last. Fintie, a quality product within your reach! Tech Specs: 1. Material: Woven Nylon 2. For Wrist Size: 6.29 inches - 8.46 inches (160mm - 215mm) 3. And other traditional or Smart Watches with standard "22mm" lug width. 1. 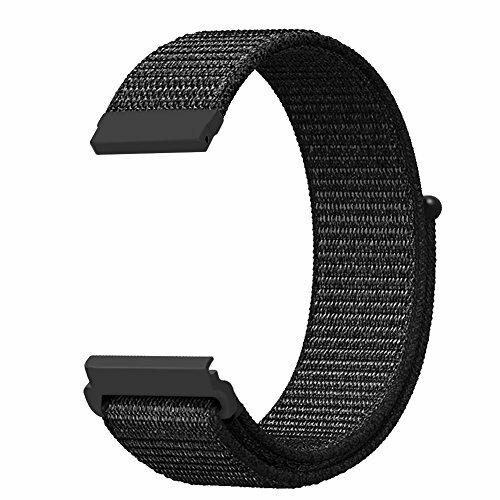 Soft, breathable, and lightweight Sport Loop band. 2. The double-layer nylon weave has dense loops on the skin side that provide soft cushioning while allowing moisture to escape. 3. Simple and easy to install and remove, no tools needed. 4. Unique hook and loop fastener design, just stick and lock your smartwatch band easily. 5. The size can be adjusted according to the circumstance of individual wrist. Compatibility: designed for Samsung Gear S3 Classic / Gear S3 Frontier; Pebble Time / Pebble Classic / Pebble Time Steel; Moto 360 Gen 2 46mm or any standard "22mm" watch. Comfortable Wearing: soft, breathable nylon weave materials by knitting craftsmanship to prevent loosing, ensure a comfortable and breathable feeling. Adjustable Buckle: secure the band with an easily adjustable hook and loop fastener. Fits 6.29"- 8.46" (160mm-215mm) wrist. Replace Watch Band Easily: coming with Quick Release Spring Pins, easy to replace or exchange the strap band without tools within seconds.